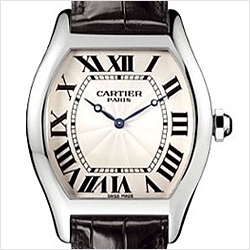 Headquartered and founded in Paris, France in 1847, the namesake brand of Cartier established itself by catering to the extravagant desires of elite society, building a flourishing reputation around bespoke timepieces of luxury and sophistication. Louis-Francois Cartier worked on the Cartier brand for several decades prior to bringing in his sons into the business in 1874, who then cultivated the Cartier image we know today. 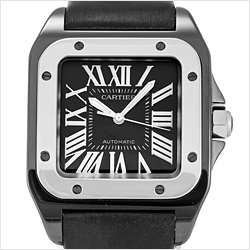 At 24diamonds.com, you will find 100% authentic and brand Cartier watches for sale. By the time the 20th Century dawned, Cartier had made several significant creations. In 1888, the first ladies’ bracelet watch was created and by the time 1904 came around, Louis Cartier had created the first wristwatch which had a flat profile and a square bezel. This Cartier watch was inspired by Alberto Santos-Dumont, a Brazilian pilot who complained that he needed a timepiece that was more reliable than a pocket watch. 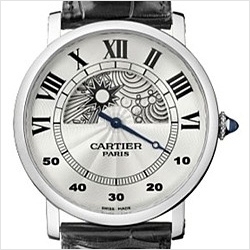 About three years later, in 1907, Cartier signed a partnership agreement with Edmond Jaeger, who would exclusively supply the brand’s watch movements, ultimately leading the Cartier brand to use top de haute horlogerie maisons. 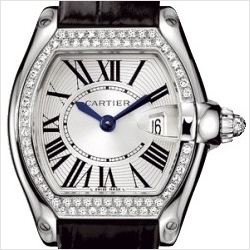 By the time the agreement had been signed, Cartier had gained widespread popularity and opened up boutiques in New York, London, and St. Petersburg. 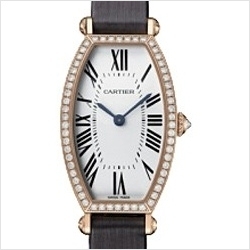 During the early 1900’s, Cartier began to produce a wider variety of watches, first beginning with the Tortue and Baignoire watches in 1912 and then a Cartier Panther model in 1914 for the ladies. However, it wasn’t until 1917, when further inspiration hit and the legendary Tank by Louis Cartier was born. The Tank ended up going on to become the signature model for Cartier and was worn by several famous women including Princess Diana and Jacqueline Kennedy. By the 1920’s, other companies began to imitate the Cartier brand, which cause Cartier to add reference numbers to its lineup. Unfortunately, following the death of Louis Francois Cartier’s grandson, the family decided to sell the family business to a group of investors in 1972. 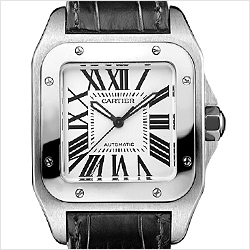 In the following years, a new collection of watches was created under the Les Must de Cartier slogan, the legendary Tank received a modern update called the Tank Americaine, and released the Santos 100 as part of their 100th anniversary of the Santos model. 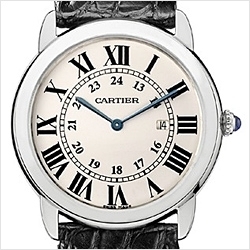 With over 150 years behind the Cartier brand, it is without a doubt that their unparalleled reputation and classic designs are one-of-a-kind and highly regarded as luxury timepieces. 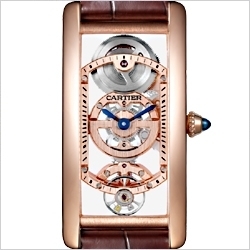 Ballon Bleu De Cartier watch collection offers men and women alike an exquisite taste of character and sophistication. Created by Parisian jewellers, Ballon Bleu comes with an unconventional design, sporting a blue sapphire cabochon crown on the right side of the timepiece. Fashioned with a slightly curved case and a distinctive collection of unique features like dials adorned with fine diamonds and blue steel sword-shaped hour hands, the entire model has an airy and luxurious feel while still capturing both feminine and masculine features. 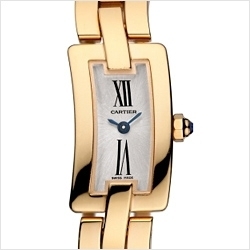 Ballon Bleu De watches by Cartier include a wide range of styles and sizes for both men and women, measuring 28, 33, 36, 40 and 42 millimetres with high-grade materials such as 18k white, yellow, rose gold, platinum and stainless steel. 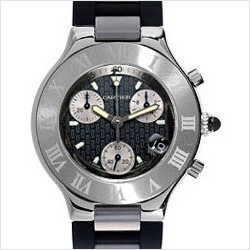 Characteristics include bold roman numerals, a clear pearl dial protected by scratch resistant sapphire crystal, and steel or leather bracelets. 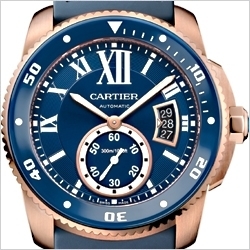 Carter Ballon Bleu watches are water resistant up to 30 meters or 100 feet. Calibre De Cartier watch collection features sheer elegance by fusing timeless and classic design of traditional circular Cartier timepieces with a newly interpreted contemporary sense of style. Over the three lines, Calibre De Cartier Diver, Calibre De Cartier and Calibre De Cartier Chronograph, there are seventeen watches in total, all of which have distinctive looks. 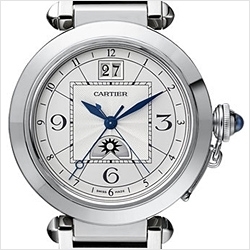 Calibre De Cartier watches feature round cases in a variety of precious metals, classic Roman numerals with hour indexes which are set against a silky silver sun brushed dial, blue sword-shaped steel hour hands, self-winding mechanical movement, faceted sapphire crystal with anti-glare and scratch resistance, and numerous options for bracelets including semi-matte leather alligator straps, stainless steel and rubber options. Beyond this, each Calibre De Cartier watch comes with a small seconds sub dial at the six o’clock mark, a discreet date window at the third hour, and for the traditional Calibre De Cartier, a 30 meter or 100 feet water resistance. 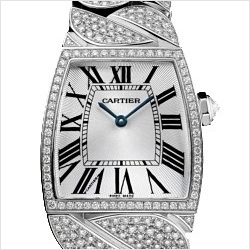 Cartier Tank watch collection provides wearers with a simple, straightforward, and bold watch design that utilizes a rectangular shape for its casing, clean and crisp lines, distinctive lugs, and a leather bracelet or stainless steel bracelet. Drawing inspiration from World War 1 tank machines, the Cartier Tank collection has multiple lineups, including Tank Louis Cartier, Tank Americaine, Tank Francaise, Tank Anglaise, Tank Solo, and Tank MC. 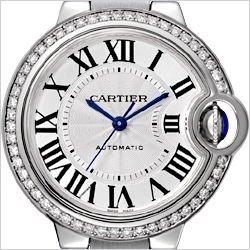 Each Cartier watch comes with a rectangular casing, blue steel hands, elongated Roman numeral hour markers, a refined colour accent on the crown of the watch, and of course, the sapphire cabochon. Tank Louis is manufactured in yellow or white gold and a transparent case and is falls closest to the original design, whereas, Tank Americaine has an elongated case with a pronounced curve. And they are powered by amazing mechanical manual winding movement, automatic self-winding or precise quartz movements. Francaise comes in steel, yellow, or pink gold, and is equipped with quartz movement and a sharp-edged case. 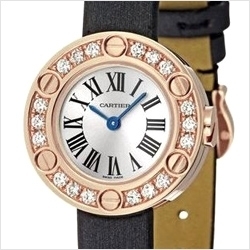 Cartier Anglaise, Tank Solo, and MC all have streamlined design, are available in multiple sizes, and can be purchased in steel, yellow and rose gold.